A 35 year old female presents with haemoptysis, epistaxis and acute renal impairment. A chest radiograph is taken and a second radiograph is taken a week later. 1. Which of the following is the least likely diagnosis for these radiographic appearances? 2. What is the most likely unifying diagnosis given the clinical history? A 33-year-old male non-smoker presents with wheeze and abnormal liver function tests on blood biochemistry. 1. b) Systemic sclerosis. Systemic sclerosis does not typically result in multiple cavitating lesions. On the initial radiograph there are multiple discrete nodules within both upper zones and within the left midzone. Cavitation of these nodules is apparent on the subsequent radiograph and which appear thick-walled. 2. d) Granulomatosis with polyangiitis. In this case, the patient was diagnosed with Granulomatosis with polyangiitis previously known as Wegener’s granulomatosis. This is characterised by a necrotising granulomatous inflammation of the upper and lower respiratory tracts. Small vessel necrotising vasculitis affecting the arteries and veins as well as a focal, necrotising glomerulonephritis. The acute renal impairment in this patient also supports the diagnosis. The presence of multiple nodules with cavitation on a chest radiograph is a common finding in granulomatosis with polyangiitis and these usually resolve with treatment over a period of months. 1. b) α1-Antitrypsin deficiency. The lungs are hyperinflated; both diaphragms are low and flat. Hypertransradiancy is also notable within both lower zones and the paucity of vessels is likely in keeping with panacinar emphysema. One way of assessing diaphragmatic flattening which is sometimes used is shown below. The highest point between the dome and a line drawn between the costophrenic and cardiophrenic angle (yellow line) is measured. This should be performed on a posterioranterior radiograph and should not measure less than 1.5 cm (blue line) in a normal individual. Genotyping confirmed this patient to have α1-antitrypsin deficiency. α1-Antitrypsin is a serum protein that inhibits a number of lysosomal proteases released during inflammatory reactions thereby inhibiting the damaging effects of enzymes released by neutrophils and macrophages. The level of α1-antitrypsin is dependent upon two co-dominant alleles that occupy one locus. In this case the patient had the PiZZ genotype which commonly results in having approx 10–15% of the expected serum antitrypsin level with early age of onset between 35–50 years. Histologically, a panacinar type of emphysema develops which predominantly affects both lower zones. Abnormal α1-antitrypsin protein can build up in the liver and may result in cirrhosis, hence the abnormal liver function tests in this case. A 47-year-old male with a history of ischaemic heart disease and previous myocardial infarction 3 years previously undergoes radiography. 1. What is the most likely diagnosis for the cardiac calcification? A radiograph is taken of a 49-year-old woman who presents with dry cough, breathlessness and weight loss. 2. Given the radiographic findings, what is the most likely unifying diagnosis? 1. c) Calcified left ventricular aneurysm. 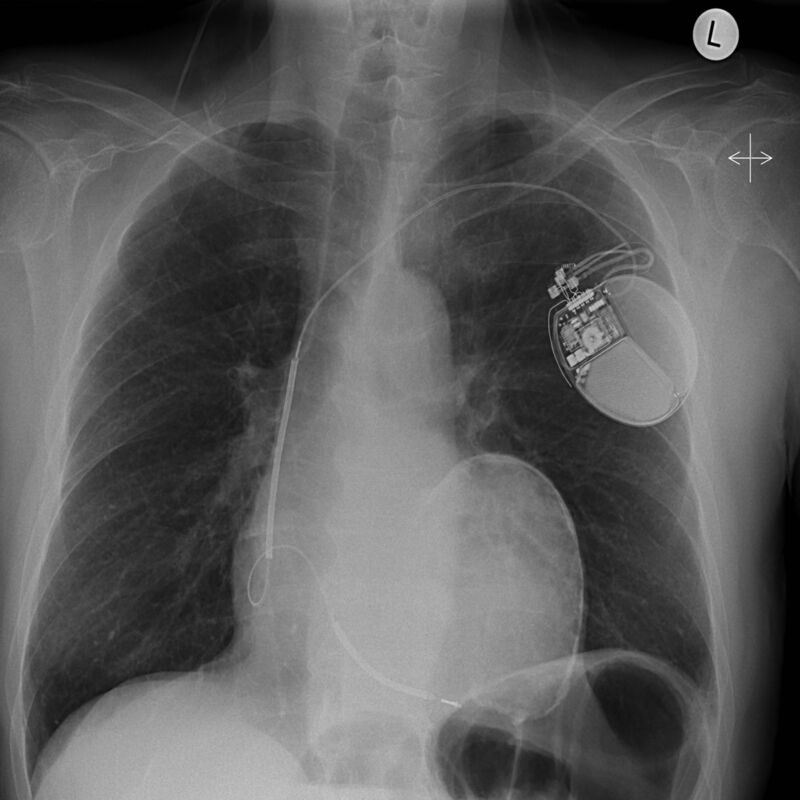 There is a single chamber cardiac pacemaker and an abnormal bulge arising from the left heart border with evidence of peripheral curvilinear calcification. The latter findings are consistent with a true left ventricular aneurysm. The main differentials to consider are whether this represents a false aneurysm, myocardial or pericardial calcification. The features of these conditions are as follows . • This is due to localised dilatation of the left ventricular wall consisting of all three layers; endocardium, thinned myocardium with fibrous tissue, epicardium. • Most often affects the left ventricle typically the apical and anterolateral segments. • The neck of the true aneurysm is wide and its diameter is similar to the maximum diameter of the aneurysm. • Aetiology is most commonly ischaemic but can be post-infectious, post-surgical and congenital. • Forms when myocardium ruptures into the pericardial space commonly secondary to a myocardial infarct. • Aetiologies include myocarditis, tuberculosis, syphilis, post-surgery and post-trauma. • Pericardium becomes inflamed and this results in a fibrotic reaction that leads to the formation of a pseudochamber which contains the haemorrhage. • The neck of the aneurysm is narrow and these lie outside the epicardium, unlike true aneurysms. • Commonly located posteriorly and they often enlarge on subsequent radiographs. • Most commonly occur post-myocardial infarction. • Usually develops towards the apex of the left ventricle. • Multiple morphologies but typically there is a soft tissue rim of ≥2 mm extending peripherally beyond the calcified myocardium in all projections. • Can be difficult to distinguish from true ventricular aneurysm but the latter forms a protrusion of the cardiac contour. • Calcification is deposited in regions of inflammation and fibrosis. • Aetiologies include tuberculous/fungal/pyogenic infections, post-surgery, post-trauma, post-radiotherapy, collagen vascular diseases, uraemic pericarditis, rheumatic fever. • Frequently over right-sided chambers where there is less pulsatility. 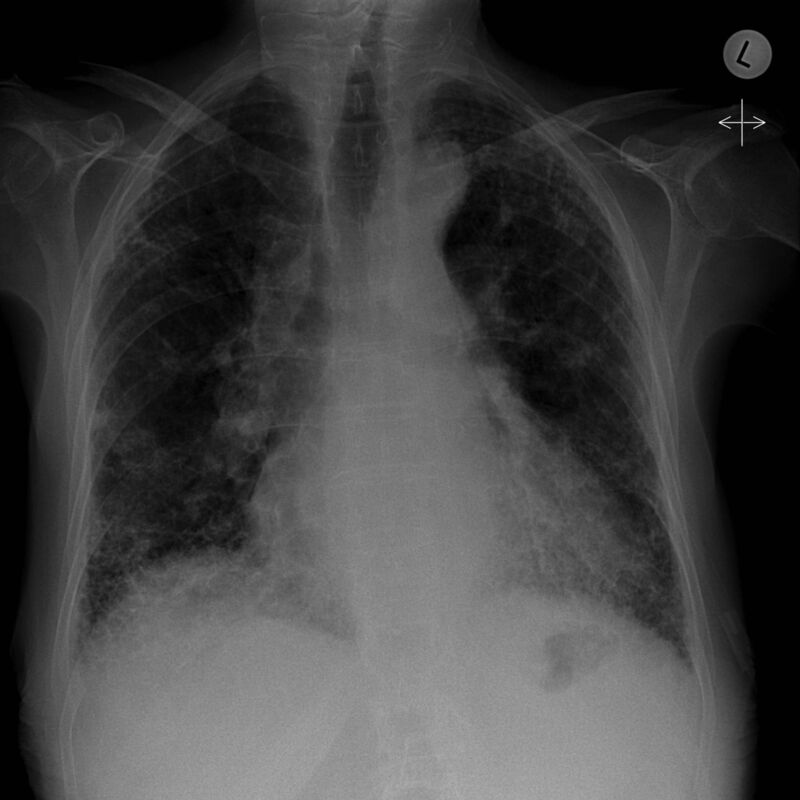 The main abnormality is the presence of lung fibrosis. There is a symmetrical reticular pattern predominantly in a subpleural and basal distribution. There is evidence of honeycomb formation best appreciated in the lower zones with loss of lung volume bilaterally. This was confirmed on spirometry which revealed a decreased total lung capacity with a restrictive lung function pattern. The right basal pulmonary artery is also prominent, raising the possibility of pulmonary arterial hypertension (as a guide, the diameter at the midpoint of a normal descending pulmonary artery should not exceed 14 mm in women, 16 mm in men). 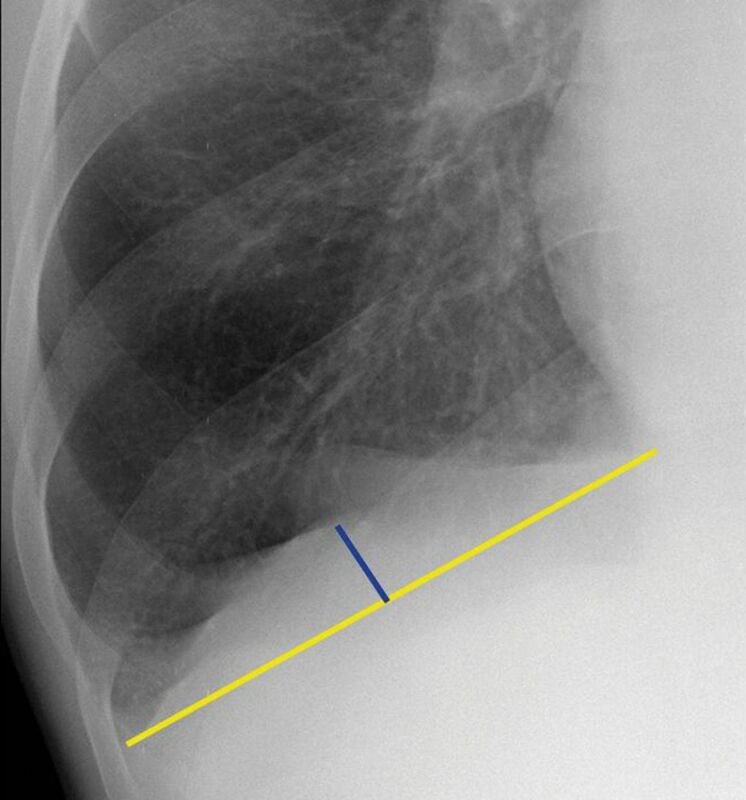 The cause of the lung fibrosis can be inferred from the chest radiograph as there is also a dilated oesophagus present; note the lucencies adjacent to the trachea on the plain radiograph (figure 6; red arrows) which correlates with the dilated oesophagus on axial computed tomography (red asterisk). Note the subpleural honeycomb formation (blue arrow). The patient has systemic sclerosis/scleroderma, a disease which is characterised by persistent overproduction and tissue deposition of collagen and related macromolecules. The lung is the fourth most commonly affected structure after skin, vessel and oesophageal involvement. 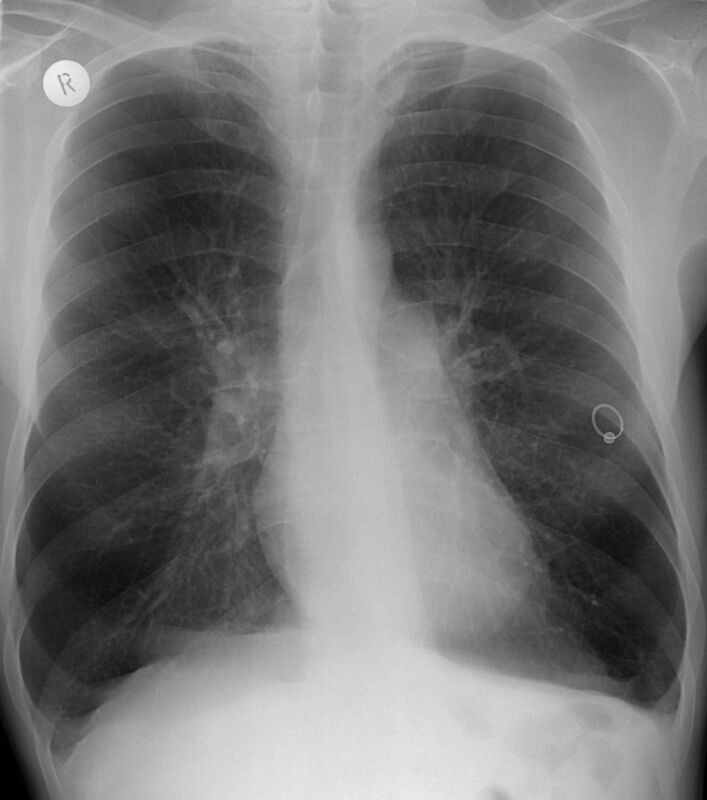 The most common pattern of lung involvement is a widespread symmetrical reticulonodular pattern as in this case. The oesophagus becomes fibrosed and there is abnormal motility: on a chest radiograph it is visible as an air-filled tube with similar appearances to an achalasia; however, the latter often demonstrates an air-fluid level.
. Cardiac and pericardial calcifications on chest radiographs. Clin Radiol 2010; 65: 685–694.